According to Transparency Market Research (TMR) the global automotive intake manifold market seems to be fragmented to a great extent, because of the emergence of a few players. Be that as it may, the main players in the global market are Mann+Hummel Group, MAHLE GmbH, Röchling Group, Magneti Marelli S.p.A., and Aisin Seiki Co., Ltd. Rise in research activities and product development are foreseen to be the key factors in guaranteeing predominance of these organizations. Key coordinated efforts are additionally anticipated to enable these organizations to secure greater share in the entire market during the forecast period. As indicated in a recent research report, the global automotive intake manifold market is estimated to be worth US$58.7 bn by 2024 from US$42.7 bn, back in 2015. The market is prognosticated to advance at a steady CAGR of 3.6% within the forecast period from 2016 to 2024. Based on materials utilized for making automotive intake manifolds the market is divided into composites, aluminum, and plastic. As per the report, aluminum segment held the major share in 2015 as it is a brilliant material that includes minimal measure of weight in the final product. 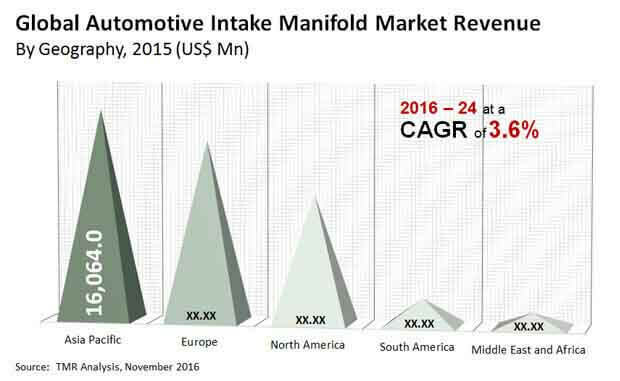 Regionally, in 2015, Asia Pacific market accounted for the maximum share in the global automotive intake manifold market. The essential drivers fuelling the development of Asia Pacific market are fast industrial advancements and extensive interests in the automotive manufacturing sector. The requirement for automotive intake manifold has been on a noticeable rise because of the stringent control by different governments to diminish the weight of vehicles to influence them to be fuel effective. Moreover, the plastics are additionally picking up the pace during production procedure as they are to a great degree light in weight and in this manner have a major effect in helping automobile makers accomplish the fuel efficiency. The indications of powerful development of the automotive sector after the ongoing financial recession has positively affected the global automotive intake manifold market as well. Nations, for example, India, China, and Japan are making a noteworthy commitment to the regularly developing demand from travelers. Increase in disposable income, expanding GDPs, and enhancing way of life are altogether anticipated that would massively affect the demand for passenger vehicles, which, thus, will expand the growth for automotive intake manifolds in the coming years. In spite of the consistent development in the entire market, the fluctuating costs of raw materials are probably going to negatively affect its income in the forthcoming years. A significant increase in the costs of aluminum and stainless steel are foreseen to hamper the development of the global market. Aluminum costs have been on a relentless surge and have significantly affected the ales and production of automobiles. The fall in fares of aluminum from China is the major factor behind these rising costs of raw materials. The requirement for automotive intake manifold has been on a noticeable rise because of the stringent control by different governments to diminish the weight of vehicles.